"They tried to convert each other, but they got married instead. Then they die." Therefore I, a prisoner for serving the Lord, beg you to lead a life worthy of your calling, for you have been called by God. Always be humble and gentle. Be patient with each other, making allowance for each other’s faults because of your love. Make every effort to keep yourselves united in the Spirit, binding yourselves together with peace. For there is one body and one Spirit, just as you have been called to one glorious hope for the future. There is one Lord, one faith, one baptism, and one God and Father, who is over all and in all and living through all. Our hero, Ignacio, shares an intimate moment with sister Incarnacion over toast. During this intimate moment, he tells the story of how his Lutheran Missionary Father & Catholic Nun Mother met & fell in love--through evangelism. He also reveals that he is an orphan by virtue of their untimely deaths. This is the quintessential passage in the epistles for Christian unity. It echos the Lord Jesus' fervent prayer that his followers would be one as he & Father God were one. All Christians have some things that unify & bind them together. There are things that must be believed in order to be considered Christian. Conversely, there are beliefs that have no place in Christendom (how about, denial of Christ's divinity? Or adding secret publications to the Bible?). Once dialog begins on these topics, we will find that there are less things that separate the denominations than we originally thought. Granted, there are a lot of differences. Real. Theological. Liturgical. Ecclesiastical. Practical differences that prevent us from forsaking the denominational structure & forming one ecumenical church. However, most rational people can admit that these issues tend to center on fringe topics that shouldn't be used as litmus tests for acceptance into the body of Christ or acknowledgement of the faithful as brothers & sisters in the family of God. Ignacio's parents did not respect the validity of each other's conversion to Christ. It appears that they set out not to convert people to Christ, but to gain converts to their own faith tradition. However, once they grew closer to one another & developed a relationship, they realized that they would not be unequally yoked as a married couple. They developed a love for one another. This month is regarded by the world as a time to reflect on & display your love. 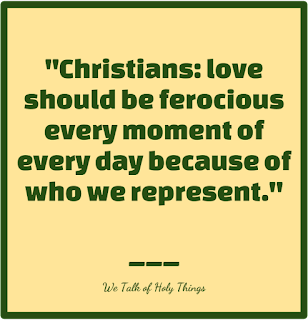 As Christians, love should be ferocious every moment of every day because of who we represent. 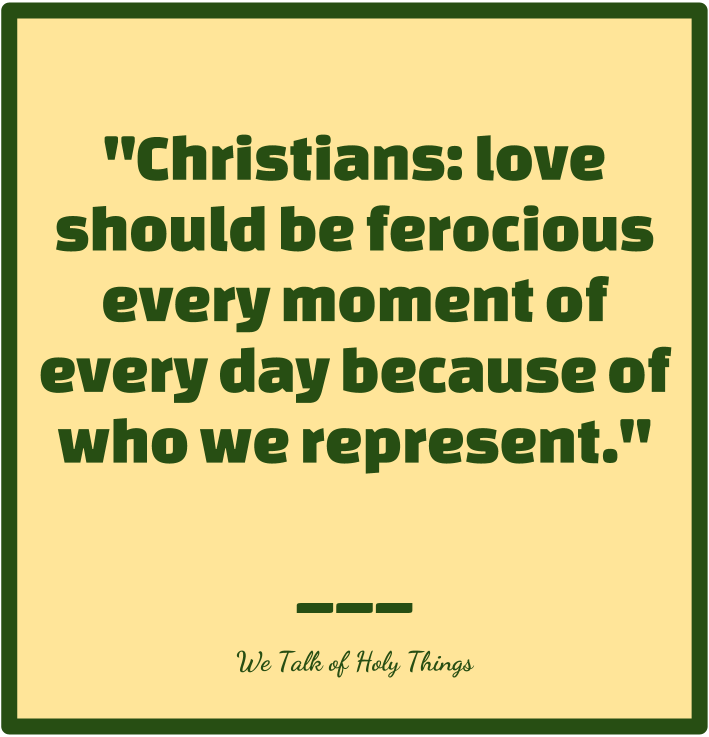 However, we tend to fall flat on our face when it comes to loving our own family in Christ. I was recently at a meeting that pointed out how outrageous it was that people in a certain location had to drive an hour & a half to attend a "New Testament Patterned Assembly" as if no other Church got the memo that the New Testament was important. It did not strike me as a loving statement. Let's not get so hung up on fringe issues that we miss the fact that we seek converts to Christ, not to our own church. Remember that Christ is our only true love. He is the one Lord, one faith, one baptism, and one God and Father, who is over all and in all and living through all.